Authors: Hai Fu et al. A few basic questions make up the core of every astronomer’s repertoire: what’s out there? Why is it the way it is? How did it get there? Here the use of the ever-imprecise “it” is intentional; these questions can be asked of virtually anything in the Universe! Today, though, we’ll be talking primarily about how some of the most massive elliptical galaxies we know about got there and how they managed to get their stars so quickly. Although several hypotheses have been put forward to explain these rare galaxies, a paper recently published in Nature (from Hai Fu and a team of collaborators from around the world) provides convincing evidence that short-lived mergers between two massive star-forming galaxies could be the main avenue for their formation. The basic picture of galaxy evolution that many people have today relies heavily on mergers (like the one in this neat video) to explain the transition from “young”, gas-rich, spiral galaxies to “old”, gas-poor, elliptical galaxies. Sometimes you’ll see people talk about color instead of age (i.e., saying spiral galaxies are “blue” and elliptical galaxies are “red”), which just refers to the fact that as stellar populations age, the massive O and B stars, which are contributing strongly at bluer wavelengths, die off and leave behind their longer-lived A-type siblings, which give off most of the their light at longer wavelengths. This simple cartoon of galaxy evolution breaks down somewhat at high-redshift, because most gas-rich star-forming galaxies haven’t had time to settle into rotation-dominated disks in the 2-3 billion years from the Big Bang to redshifts of 2-3. Still, astronomers invoke mergers to explain the formation of elliptical galaxies because they produce the characteristics we observe in elliptical galaxies: when two gas-rich galaxies collide and eventually combine into a single larger system, that collision triggers an increase in star-formation, which can use up the gas and effectively end future star-formation, and reorders the orbits of all of the stars, so they are randomly oriented and the galaxy becomes more dispersion-dominated. After about a billion years, the end result of the merger is a red, gas-poor, elliptical galaxy. Unfortunately, many mergers consist of a massive galaxy (with about 50 billion solar masses) colliding with a less-massive companion galaxy, either or both of which may be gas-poor, which would seem to make the formation of very massive elliptical galaxies (with 200 billion solar masses!) by redshift 2 fairly unlikely. However, since we see a population of these massive ellipticals at redshifts around 2, massive gas-rich galaxies must be merging with each other at some non-negligible rate, despite the paucity of observational evidence. The most likely candidates for the galaxies which merge to form massive ellipticals are a special kind of star-forming galaxy known as submillimeter galaxies (or SMGs). 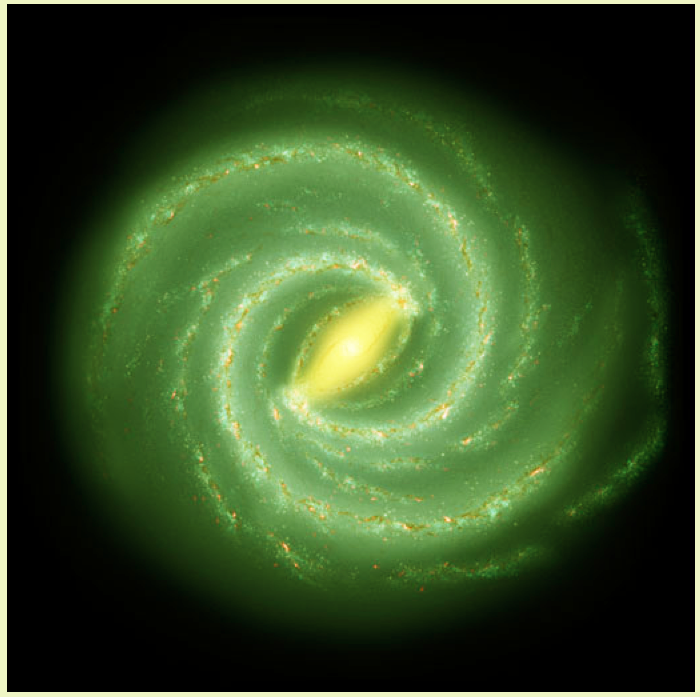 Submillimeter galaxies are identified by the large amount of energy coming out at submillimeter wavelengths, which is predominately thermal emission from dust in the galaxy. This emission is associated with rapid star formation, because the dust, which typically has a temperature of a few 10s of Kelvin, is heated by radiation from hot, young stars. In fact, SMGs are some of the most extreme starbursts ever observed, with star formation rates sometimes exceeding 1000 solar masses a year! This rate of star formation rapidly depletes the reservoir of molecular gas in an SMG, leading to a relatively short “duty cycle”; this contributes to the relatively low surface density of SMGs on the sky. Nevertheless, submillimeter galaxies can be more easily detected at high redshift than other galaxies due to the effect of a negative K-correction, which makes them interesting and useful targets for studying galaxy evolution in the distant Universe. The paper by Fu et al. focuses on an unusual SMG at a redshift of 2.3 (less than 3 billion years after the Big Bang) named HXMM01, discovered as part of the Herschel Multi-tiered Extragalactic Survey (HerMES). In many ways, HXMM01 is a superlative SMG: it is among “the brightest, most luminous, and most gas-rich” such galaxies known. But it was also hiding a secret that the authors only discovered when they made high-resolution follow-up observations with ground-based telescopes. What looked like only a bright dot in the near-infrared Herschel data (Figure 1, left panel) was revealed to be two distinct components with a bridge of material in the Keck, SMA, and JVLA observations (Figure 1, right panel). The physical proximity and observed kinematics confirmed that HXMM01 was actually two separate galaxies undergoing a merger. More detailed analysis provided good estimates of the physical properties of X01N and X01S, as the authors refer to the two galaxies. Characterization of the dust emission led to a measurement of 55 K for the dust temperature, among the hottest seen in starburst galaxies, and a total infrared luminosity which translates to a star formation rate of 2000 solar masses a year. Estimates of stellar and gas masses imply a combined gas fraction of around 52%, which also exceeds that observed in similar-mass star-forming galaxies at the same redshift. The measured star formation rate and gas mass mean that HXMM01 will quickly use up most of its gas and could cease forming stars within approximately 230 million years. This timescale suggests that by a redshift of ~1.7, HXMM01 will be a passive elliptical galaxy with 400 billion solar masses, which is on the same order as the most massive elliptical galaxies at redshift 2. The authors estimate that there is only one bright SMG-SMG merger like HXMM01 per 100 square degrees, which explains the previous lack of observations of this phenomenon in the past. When they account for issues like the short lifetime of such mergers, they derive a number density which seems to comparable to that of the most massive elliptical galaxies at z~1.1. Based on this, they claim that, despite the rarity of mergers like the one HXMM01 is undergoing, they are an important part of the best explanation for how massive ellipticals form and rapidly acquire much of their stellar population in a short period of time.